Let's just admit it: Yellow and orange Starbursts are the lesser of the chewy sugar cubes. Red—and most of all, pink—are the ones that really drive candy sales. But unless you're a rock star with a crazy specific rider, then you're probably not treated to bowls of entirely pink Starbursts wherever you go. Luckily, the brand is finally pulling an Oops! All Berries move and giving the people what they want—a whole pack of just the strawberry flavor. 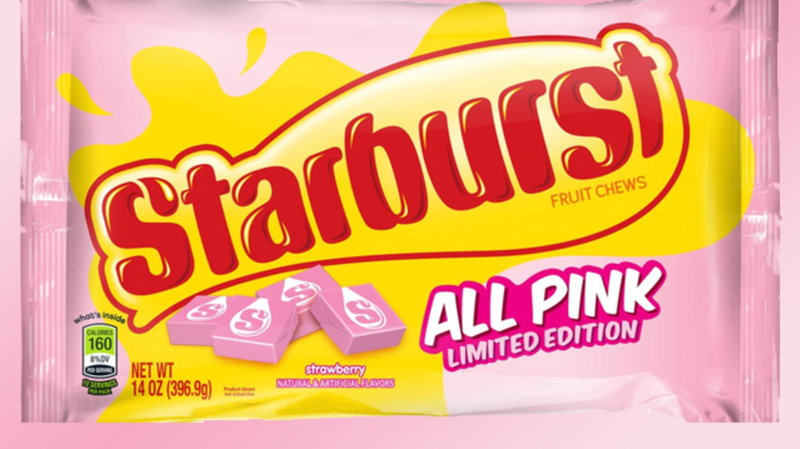 The limited edition Starburst All Pink packs were officially announced today and our teeth are hurting already. Next month you'll be able to find the crowd pleasers nationwide at stores like Walmart, Walgreens, Target, and Amazon. Before the official announcement, Starburst hinted at the news by sending regular packs filled with only pink squares to celebrities on social media. The special packs will disappear from shelves after their short run in April, but worry not: You can still grab bags of specific Starburst flavors on eBay and never have to tolerate another orange candy again.